Billed as an effective and low-cost training tool, the new CO2-powered air pistol is Sig’s latest offering to those looking to get into the M17 game. 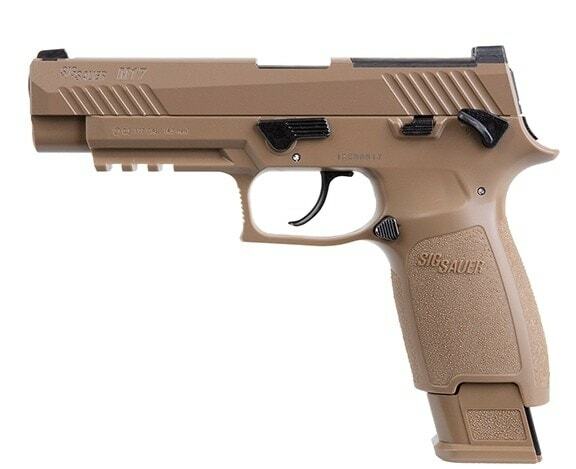 Introduced by the company’s SIG AIR branch as part of their Advanced Sport Pellet line, the .177-caliber air pistol has much the same look, feel and styling as a standard M17 handgun. Featuring a metal slide and polymer frame, the gun tips the scales at 34.4-ounces– which is actually a couple ounces more than the published specs on the military’s 9mm M17 when unloaded. Length, and sight radius, as well as surface control layout is the same. Notably, the air gun field strips like the Army pistol and includes a functional M1913 rail for accessories. The drop magazine is modeled after the extended M17 mag, which allows for training magazine exchanges, and has room for 20 pellets in an enclosed belt-fed system. Capable of firing pellets at up to 430fps, the P320-M17 Air pistol has a current price of $119. The winner of the Army’s Modular Handgun System competition, the M17 edged out a field of other big name pistol makers and has gone on to be adopted across the Department of Defense as well as by the U.S. Coast Guard as their standard handgun. Special models of the guns are even used by the Sentinels at the Tomb of the Unknowns. Taking advantage of the largest military handgun contract since the 1980s, Sig has subsequently released a series of commemorative and P320-M17-branded pistols in 9mm in addition to the new air pistol.